Recycling is a huge step in being eco-friendly, but what materials are exactly recyclable? That complex question has confused many over the past several years, to the point that waste management companies now label which items people can throw in the recycling bin. Restaurantware isn’t that confusing -- our plastic collection contains our main recyclable products. We have a vast array of plastic products, and all are recyclable. Recycling helps our environment by reducing the need for more raw materials. Thus, when you recycle one of our plastic tableware pieces, it is broken down and reused for another product. Thus, our plastic collection is very eco-friendly, and gives back to our planet. Our pipettes are sturdy and will not break when transferring liquids. These are great for innovative chefs who look to infuse different flavors into dishes. Pipettes are also a fun way to incorporate sauces and condiments for certain foods like french fries. Our recyclable plastic pipettes are easy to use and handle, and are perfect for chefs of all expertise levels. We have plastic bowls of all different shapes, styles, sizes, and colors. These bowls are perfect for a variety of uses. Whether you are looking for a bowl to display soup, salad, pudding, ice cream, nuts, or fruit, our plastic collection has what you need. Most of our plastic bowls come in seagreen, white, and black. Some come in only one color. 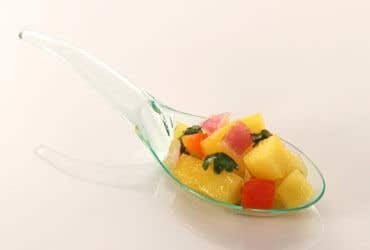 Our different styles include: Mini tasting bowl: These bowls are tiny (2 ounces) because they are made for tasting or bite-sized appetizers/desserts. These come in seagreen, white, and black. Incline bowl: These bowls are lower one one side, and incline higher on the other. They hold 6.5 ounces, and are perfect for appetizers, desserts, or sides. Incline bowls come in seagreen, white, and black. Geometric kova bowl: These bowls are charming and are very different than normal round bowls. Instead of being round, they are square on the bottom and top. They come in clear, and in 16-ounce size. Aqua bowl: These bowls have a unique, wave-like shape. They are perfect for salads, fruit, or any other small dish. These come in seagreen, white, and black. Coppa bowl: These bowls are very elegant. They have a round open top, and a small base. These are perfect for dips, condiments, or tastings. They come in seagreen, white, and black. Rectangular cocotte: These dishes are charming and add a different twist to any table. You can serve hot dishes, such as macaroni and cheese, lasagna, or other pastas. These come in seagreen, white, and black. We have more plastic stands than we do cones, but our combination tall cocktail glass with serving tray is a widely popular product. Our plastic cones and cone stands are made with premium material, so they are not flimsy and won't break easily. We have stands for cones of all sizes, from mini to regular. We also have stands in creative shapes, such as artist palettes. In addition to have stands for multiple cones at once, we also have stands for individual cones and dishes. Our stands amp up your display and showcase food perfectly. 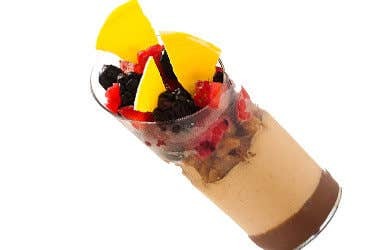 Our cup collection is very versatile and has options from dessert cups, to soup cups, to drinking cups. 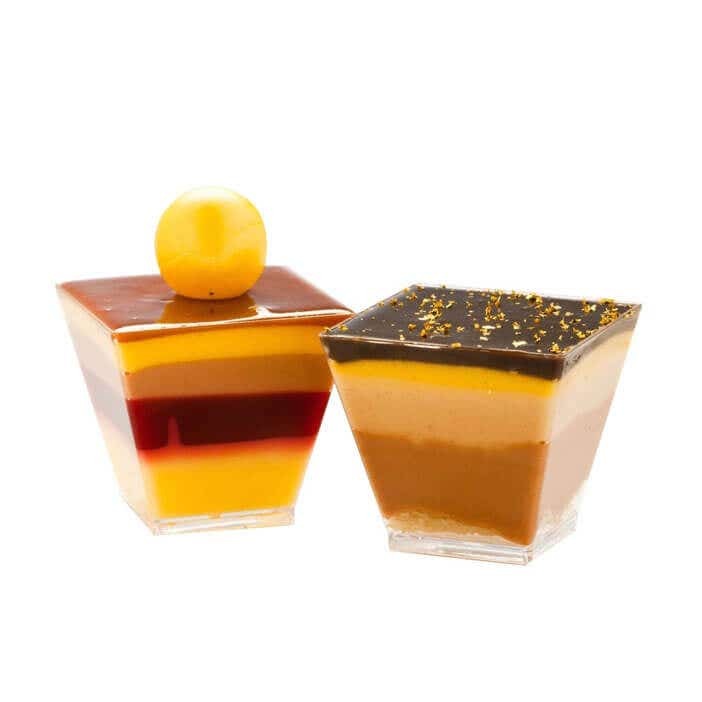 Our dessert cups come in a variety of sizes and shapes. Our plastic cups are made from premium quality plastic, so they are durable and will not break when being used. Our styles of plastic cups include, but are not limited to: Bonito cup: Our bonito cups are beautifully made to look thin and tall. These cups are perfect for yogurt parfaits, ice cream, and other similar desserts. They come in seagreen, white, and black. Quadrato cup: Our quadrato cups are square, with clean lines and a modern look. They come in two different styles: regular and tall. 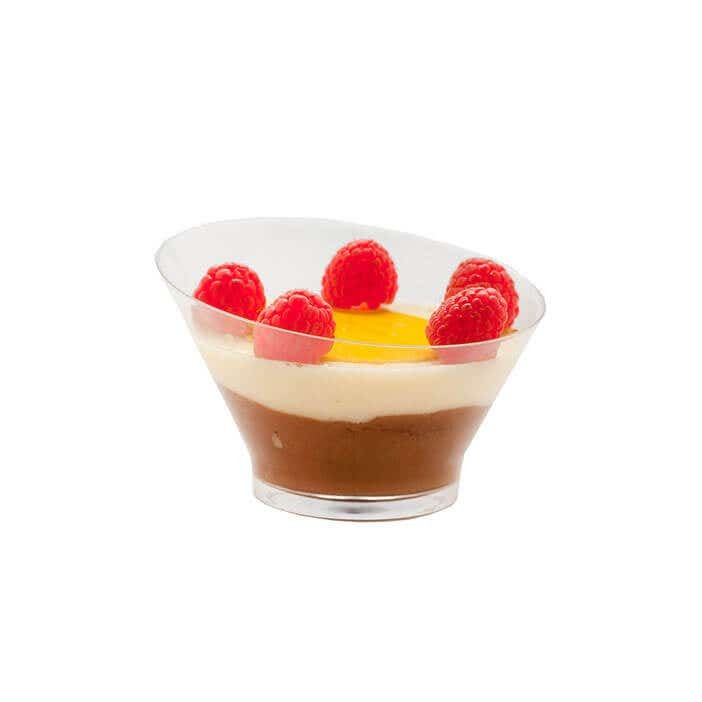 So depending on your treat, our quadrato cups can display it perfectly. They come in seagreen, white and black. Bodega cup: Our bodega cups are round and perfect for displaying salads, fruits, and other treats. These cups are very durable, and will not crack easily. They come in seagreen, clear, white, and black. Le fleur cup: Our le fleur cups are charming and beautiful. They have a design similar to flower petals on the sides. 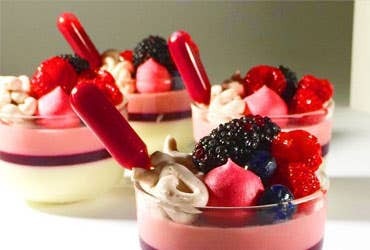 They are perfect for fashionably showcasing desserts, appetizers, or side dishes. They come in black, white, and seagreen. Cafe cup: Our cafe cups are perfect for a recyclable option to hold hot -- and cold -- beverages. They are great for serving espresso, tea, or cappuccinos. However, just because they look like coffee cups doesn't mean that's all they are used for -- get creative and try them out for a unique twist on the table. They come in clear, black, white, and seagreen. Glasses: Our plastic glass collection is an eco-friendly disposable alternative to glass. These are great for catered events, bars, and cafes. These eliminate the headache of shattered glass. 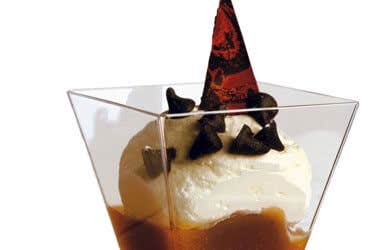 Our plastic glass collection is versatile and includes the following styles: Parfait glass: These glasses are perfect for yogurt, pudding, or any layered dish. Not only do these hold more fluid treats, but they can also showcase cones, fruit, nuts, etc. They are available in mini or large style, and clear color. Shot glass: We offer a long list of different shot glasses. These are perfect for any venue, and can be used in many different ways. Whether you are serving alcohol or dessert, our plastic shot glasses are the perfect disposable option. Edge glass: Our edge glasses are modern alternatives to regular cocktail glasses. They have clean edges on the bottom, which make them stand out among any other glasses. Aperitif glass: Our aperitif glasses are elegant and perfect for serving champagne and cocktails. The chic design makes them great for weddings, banquets, dinner parties, and other state-of-the-art events. 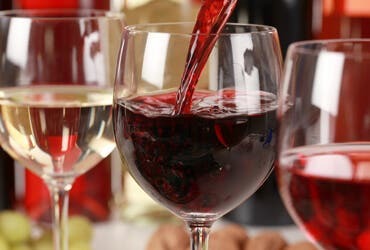 Wine glass: Our plastic wine glasses are a great alternative to glass. We offer calice wine glasses and wine goblets, which are disposable. However, we also offer reusable plastic tableware. Plates: Our plates are fashionable and disposable alternatives to other options. We have many different styles and sizes of plastic plates, and each have a special place on tables. Our plastic plates are the perfect option for catered events, dinner parties, food trucks, and other eating establishments. Our plastic plates can add a personalized touch to any dish, because of their unique designs. We many styles, including the following: Amuse bouche shell plate: These charming plates are in the shape of a clam shell. They are perfect for bite-sized appetizers or desserts. Any nautical themed venue would find these plates great for their tables. We also have coquille plates that would also go along with a beach theme.They come in black, white, and seagreen. Edge plate: Our edge plates are perfect for giving chefs a clean slate to design their dishes. The edges are great to exhibit plating techniques. The design of these plates is modern and chic, and these are lovely in a variety of venues. They come in seagreen, white, and black. Shooting star plate: Our shooting star plate is made for appetizers and other small dishes. These are a unique twist on regular plates because the edges resemble a star. They are available in black, white, and seagreen. Rotondo plate: Our rotondo plates are round, deep dishes perfect for presenting dry or more fluid foods. These plates are perfect for ice cream sundaes, as well as finger foods. They come in white, black, and seagreen. Handled plate: Our handled plates add a special touch when compared to regular plates. They come with handles on two sides, and are perfect for serving appetizers, side dishes, or desserts. They are available in black, seagreen, and white. Triangolo plate: Our triangolo plate are another modern, geometric option. They are triangular, and are perfect for serving slices of cakes or pies. They are available in black, seagreen, and white. Comma plate: Comma plates are shaped like an eye and are great for serving dips, salads, fruits, and many more dishes. They are a unique alternative to regular plates. They come in white, black or seagreen. Terzetto plate: Our terzetto plates are a 3-in-1 package. Three plates are connected to make it easy for guests to sample different dishes. The innovative design make these plates perfect for cocktail parties, buffets, or bars. They come in white, black, and seagreen. Our plastic collection offers many different options for your tables. Each is made with premium material, so they will surely impress your customers. At Restaurantware, we strive to provide the most eco-friendly, yet fashionable, disposable tableware, and our plastic collection is perfect for attaining this goal. Recycling is a huge step in being eco-friendly, but what materials are exactly recyclable? That complex question has confused many over the past several years, to the point that waste management companies now label which items people can throw in the recycling bin. Restaurantware isn't that confusing -- our plastic collection contains our main recyclable products. Pipettes: Our pipettes are sturdy and will not break when transferring liquids. These are great for innovative chefs who look to infuse different flavors into dishes. Pipettes are also a fun way to incorporate sauces and condiments for certain foods like french fries. Our recyclable plastic pipettes are easy to use and handle, and are perfect for chefs of all expertise levels. Mini tasting bowl: These bowls are tiny (2 ounces) because they are made for tasting or bite-sized appetizers/desserts. These come in seagreen, white, and black. Incline bowl: These bowls are lower one one side, and incline higher on the other. They hold 6.5 ounces, and are perfect for appetizers, desserts, or sides. Incline bowls come in seagreen, white, and black. Geometric kova bowl: These bowls are charming and are very different than normal round bowls. Instead of being round, they are square on the bottom and top. They come in clear, and in 16-ounce size. Aqua bowl: These bowls have a unique, wave-like shape. They are perfect for salads, fruit, or any other small dish. These come in seagreen, white, and black. Coppa bowl: These bowls are very elegant. They have a round open top, and a small base. These are perfect for dips, condiments, or tastings. They come in seagreen, white, and black. Rectangular cocotte: These dishes are charming and add a different twist to any table. You can serve hot dishes, such as macaroni and cheese, lasagna, or other pastas. These come in seagreen, white, and black. Cones & Stands: We have more plastic stands than we do cones, but our combination tall cocktail glass with serving tray is a widely popular product. Our plastic cones and cone stands are made with premium material, so they are not flimsy and won't break easily. We have stands for cones of all sizes, from mini to regular. We also have stands in creative shapes, such as artist palettes. In addition to have stands for multiple cones at once, we also have stands for individual cones and dishes. Our stands amp up your display and showcase food perfectly. Bonito cup: Our bonito cups are beautifully made to look thin and tall. These cups are perfect for yogurt parfaits, ice cream, and other similar desserts. They come in seagreen, white, and black. Quadrato cup: Our quadrato cups are square, with clean lines and a modern look. They come in two different styles: regular and tall. So depending on your treat, our quadrato cups can display it perfectly. They come in seagreen, white and black. Bodega cup: Our bodega cups are round and perfect for displaying salads, fruits, and other treats. These cups are very durable, and will not crack easily. They come in seagreen, clear, white, and black. Le fleur cup: Our le fleur cups are charming and beautiful. They have a design similar to flower petals on the sides. 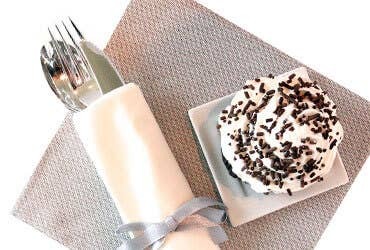 They are perfect for fashionably showcasing desserts, appetizers, or side dishes. They come in black, white, and seagreen. Cafe cup: Our cafe cups are perfect for a recyclable option to hold hot -- and cold -- beverages. They are great for serving espresso, tea, or cappuccinos. However, just because they look like coffee cups doesn't mean that's all they are used for -- get creative and try them out for a unique twist on the table. They come in clear, black, white, and seagreen. 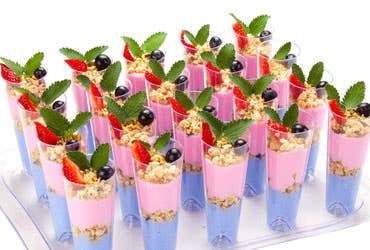 Parfait glass: These glasses are perfect for yogurt, pudding, or any layered dish. 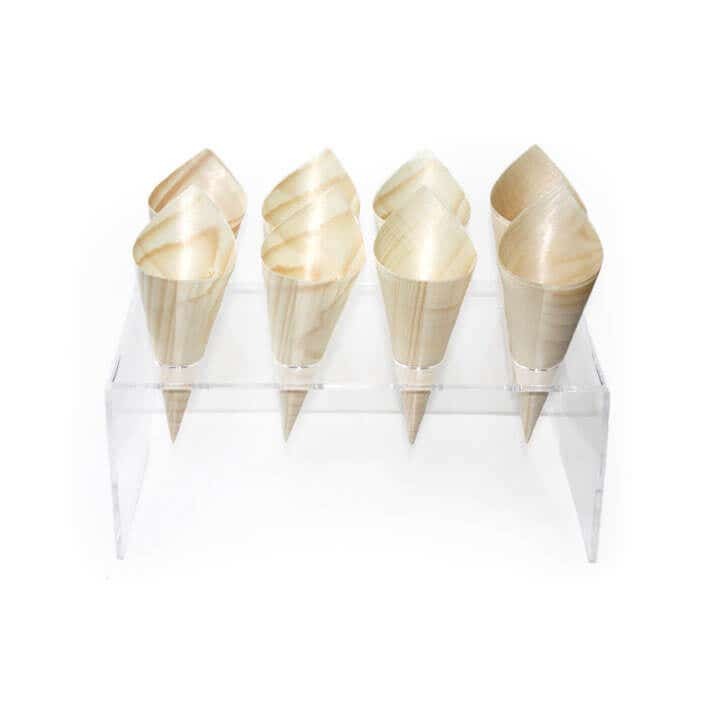 Not only do these hold more fluid treats, but they can also showcase cones, fruit, nuts, etc. They are available in mini or large style, and clear color. Shot glass: We offer a long list of different shot glasses. These are perfect for any venue, and can be used in many different ways. Whether you are serving alcohol or dessert, our plastic shot glasses are the perfect disposable option. Edge glass: Our edge glasses are modern alternatives to regular cocktail glasses. They have clean edges on the bottom, which make them stand out among any other glasses. Aperitif glass: Our aperitif glasses are elegant and perfect for serving champagne and cocktails. The chic design makes them great for weddings, banquets, dinner parties, and other state-of-the-art events. 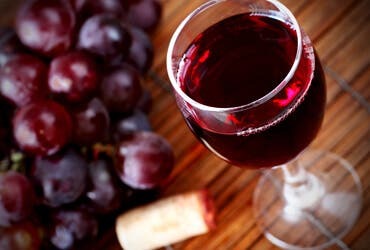 Wine glass: Our plastic wine glasses are a great alternative to glass. We offer calice wine glasses and wine goblets, which our disposable. However, we also offer our Vino Bello collection and these are shatterproof and reusable, although they are still made of recyclable plastic. 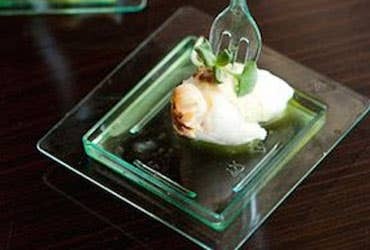 Amuse bouche shell plate: These charming plates are in the shape of a clam shell. They are perfect for bite-sized appetizers or desserts. Any nautical themed venue would find these plates great for their tables. We also have coquille plates that would also go along with a beach theme.They come in black, white, and seagreen. Edge plate: Our edge plates are perfect for giving chefs a clean slate to design their dishes. The edges are great to exhibit plating techniques. The design of these plates is modern and chic, and these are lovely in a variety of venues. They come in seagreen, white, and black. Shooting star plate: Our shooting star plate is made for appetizers and other small dishes. These are a unique twist on regular plates because the edges resemble a star. They are available in black, white, and seagreen. Rotondo plate: Our rotondo plates are round, deep dishes perfect for presenting dry or more fluid foods. These plates are perfect for ice cream sundaes, as well as finger foods. They come in white, black, and seagreen. Handled plate: Our handled plates add a special touch when compared to regular plates. They come with handles on two sides, and are perfect for serving appetizers, side dishes, or desserts. They are available in black, seagreen, and white. Triangolo plate: Our triangolo plate are another modern, geometric option. They are triangular, and are perfect for serving slices of cakes or pies. They are available in black, seagreen, and white. Comma plate: Comma plates are shaped like an eye and are great for serving dips, salads, fruits, and many more dishes. They are a unique alternative to regular plates. They come in white, black or seagreen. Terzetto plate: Our terzetto plates are a 3-in-1 package. Three plates are connected to make it easy for guests to sample different dishes. The innovative design make these plates perfect for cocktail parties, buffets, or bars. They come in white, black, and seagreen.